Unless you're blessed with a walk-in closet the size of a studio apartment, there comes a time when you must clean it out - especially if you're a frequent shopper. Consigning the items you want to discard can replenish your funds. When it comes to that pricey boutique dress you wore only once or that sample sale find that didn't really fit, or that piece of jewelry that you’re tired of, or the sparkling bric-a-brac of which you have far too many, sending them back out into the world will make another shopper happy while padding your wallet. 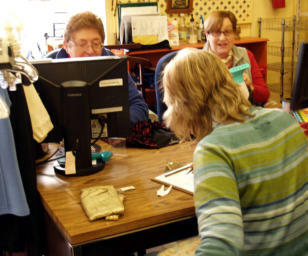 And that’s where we come in: We’re the volunteers at Willing Hearts Consignment Shop. The shop is managed and fully staffed by volunteers for the benefit of the Rotary Club of the Caldwells and its various projects and charities. We accept donations and certain merchandise on consignment. The fashion industry is in an age known as “fast clothing.” Clothing becomes obsolete and easily disposable in large quantities because it’s very inexpensive to mass produce. The EPA estimates that 12.7 million tons of clothes are thrown away every year. Clothing creates massive landfill waste and many artificial fibers do not decompose quickly or at all. The same is true for giftware. Our goal is to provide quality shopping at affordable prices. We accept apparel, jewelry, furs, accessories, home decor and housewares consignment items and donations which we recycle in the community. Recycling your treasures with us means you care enough about them, your community and our environment to give them a new life and for a great cause! Rotary Club service projects include Help the Children Hear which provides hearing aids for deaf children and The Gift of Life, an international program for children and infants who need life-saving heart surgery. Donating your items not only helps the environment and the community, but it also creates a sense of pride in knowing that you are helping others as well as decluttering your home. Sometimes we’re reluctant to part with items that we’ve purchased because we view it as wasting money. But getting rid of clutter can free your mind of frustration, stress and embarrassment. If you have items that no longer fit, or that you don’t like because you bought them on an impulse, or things that are simply collecting dust, let us find them a new home. Since October,1997, nearly $1.5 million (after operating costs) has been generated by Willing Hearts Consignment Shop for Rotary Club of the Caldwell’s charitable projects. 1997- 2017: Twenty years of great buys & service to the community! > WILLING HEARTS CONSIGNMENT HOURS CAN BE FOUND HERE. > 2019 CALENDAR OF IMPORTANT DATES CAN BE VIEWED HERE AND DOWLOADED HERE. > DONATIONS WILL ONLY BE ACCEPTED DURING REGULAR STORE HOURS! > 2019 CONSIGNMENT SCHEDULE SALE DATES & COLORS CAN BE DOWNLOADED HERE. > CHANDELIERS ARE NO LONGER ACCEPTED FOR CONSIGNMENT AS OF 4/2/2019. HOT PINK TAGS: 4/23-27, 2019! Since October,1997, nearly $1.5 million (after operating costs) has been generated by Willing Hearts for Rotary Club of the Caldwell’s charities. WILLING HEARTS GIFT CERTIFICATES ARE AVAILABLE IN ANY DENOMINATION - TRULY A GIFT THAT KEEPS ON GIVING! CONSIGNMENT HOURS CAN BE FOUND HERE. DONATIONS WILL ONLY BE ACCEPTED DURING BUSINESS HOURS. THE NEW 2019 CALENDAR 0F IMPORTANT DATES CAN BE VIEWED HERE AND DOWNLOADED HERE. 2019 CONSIGNMENT SCHEDULE SALE DATES CAN BE DOWNLOADED HERE. You bring your things to us at Willing Hearts Consignment Shop so that we can sell them on your behalf. The Shop does not own your merchandise. The Shop pays you, the consignor, when your goods sell. Consigning your items at Willing Hearts means you care enough about them to give them a new life! All clothing should be clean and pressed (no wrinkles). Jewelry, household items and collectibles should be clean and in good condition. We will not clean your items for you. Your items MUST be saleable and something you might buy. Review our current lists of what we accept for consignment and what we cannot accept for consignment on a regular basis. HOW DO I BECOME A WILLING HEARTS CONSIGNOR? It’s easy! 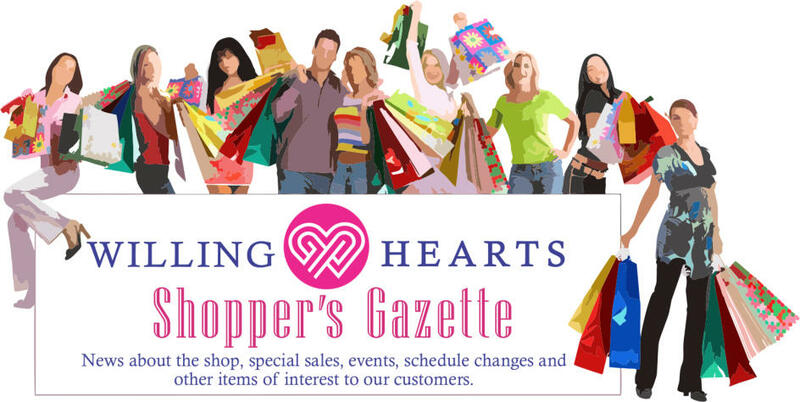 You can become a Willing Hearts regular consignor by paying an annual $20 membership fee (see annual membership fee statement). When you join you receive a Consignor ID number and can then begin consigning 20 items per month, up to 10 items at a time during scheduled consignment hours. Your membership will remain valid as long as you pay your annual membership fee. Drop by the shop and ask any volunteer and tell your friends that new enrollments for membership are taken any time. You can view and download a Willing Hearts Consignment Shop Consigner’s Contract here. HOW IS A VALUE DETERMINED FOR MY ITEMS? 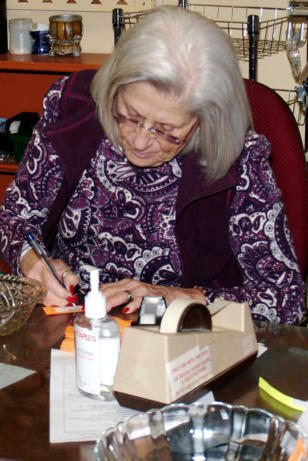 During your consignment session a volunteer experienced at pricing will help you set a price for your items. A rule of thumb determining the value of consigned items is 1/3 of the original retail price but this varies a great deal depending on the item and its condition. Remember that our goal is to sell your items at the best price possible so trust the judgment of your volunteer. Each Tuesday marks the beginning of the next consignment week. Your items are on the floor for 4 consignment weeks at full price. If your items sell in weeks 1 through 4 you get 60% of the price. The week you consign your items is considered to be the first of the 4 weeks at the full consigned price. At the end of the week 4, you can decide to take your unsold items home or you can donate them to the shop. Items left in the shop become the property of Willing Hearts Consignment Shop/Rotary. On the first Tuesday of the 5th week, all items are reduced by 50% and all proceeds of the sale of these donated items go to Rotary Club of The Caldwells. Further price reductions may be made at the discretion of the manager. Items not sold after 5 weeks are forwarded to a variety of shelters that are affiliated with Willing Hearts. You may ask for a tax letter for your donated items. You are responsible for keeping your own inventory. You may ask about the status of your account only during the 4th consignment week and only during consignment hours. Please note that only one consignor ID number can be used per consignment session. Checks are ready on or before the 10th of each month for items sold during the previous calendar month. A statement accompanies each check. Checks may be cashed up to 120 days after the issue date. Checks are void after 120 days and are considered a donation to Rotary Club of The Caldwells. You should pick up your check to avoid losing your payment. If you are away from home for a long period of time, you may leave a self-addressed stamped envelope in the office. Sorry, but checks will not be cashed in the shop, unless being used to purchase merchandise. CAN I ALSO DONATE TO WILLING HEARTS? WHAT IS THE SPECIAL CATEGORY OF CONSIGNMENT CALLED HARDSHIP? 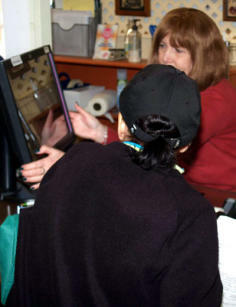 A volunteer uses the new computerized consignment system. 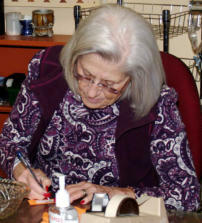 A volunteer prices an item. Willing Hearts Volunteers (left, in front of monitors) assist consignors in pricing and collecting their items for sale. Consignor’s view behind monitors as the volunteers assist. Exception to the 4-week rule: All holiday merchandise will be removed immediately after the holiday. All holiday items not picked up from the shop ONE week after the holiday will be donated to a shelter. INCLEMENT WEATHER: In case of inclement weather, call the shop at 973-226-7488 after 8:30 am to check for opening times, or check our website at www.willinghearts.com. Donations are gladly accepted during business hours at the rear of the shop. Donation letters are available. YOU CAN DOWNLOAD A PDF VERSION OF WILLING HEARTS CONSIGNMENT INFORMATION AND RULES HERE. APRIL CONSIGNMENT: April 2 – May 4 April 16: Mother’s Day items accepted April 30: Memorial Day items and summer apparel accepted MAY CONSIGNMENT: May 7 – June 1 May 7: NO BLUE DENIM JEANS OR COMFORTERS UNTIL SEPTEMBER May 21: Father’s Day items accepted JUNE CONSIGNMENT: June 4 - 29 June 4: July 4 th items accepted JULY CONSIGNMENT: July 2 - 27 July 4: Closed for July 4 th holiday July 23-27: Last week of summer consignment NO AUGUST CONSIGMENT August 20-22: End of season clearance August 23: Closed for summer break September 10: Reopen Exception to the 4-week rule: All holiday merchandise will be removed immediately after the holiday. All holiday items not picked up from the shop ONE week after the holiday will be donated to a shelter. YOU CAN DOWNLOAD A COPY OF THE 2019 WEEKLY SALE DATES AND TAG COLORS HERE. CONSIGNOR ANNUAL MEMBERSHIP FEE REINSTITUTED Because of the increased demand for our services and an increase in our overhead expenses, Willing Hearts is reinstituting the annual membership renewal fee for all regular and unlimited consignor members. For Regular Consignors: Before you can consign as a regular consignor, you must pay the annual fee of $20. A new anniversary date will be established at the time of payment. For Unlimited Consignors (those enrolled prior to 12/31/16): Unlimited Consignors must pay the annual fee of $30. A new anniversary date will be established at the time of payment. Because of the increased demand for our services, we can no longer accept NEW unlimited consignors. For Hardship Consignors: Before you can consign as an Hardship consignor, you must pay the 1-month renewal fee of $30. If you wish to continue consigning, you can renew this membership for an additional 1 month by paying another $30 renewal fee. You will be informed of any changes in fees and consignment rules well in advance of future renewals. Consignors in all categories will be informed of any changes in fees and consignment rules well in advance of future renewals. At the Jan, 2017 meeting, volunteers are informed of new membership fees. 1. If you choose to be a walk-in consignor, take a number at the cash register and wait to be called. Watch the electronic number display and wait to hear your number called. Missing your number means missing your turn in line. 2. When your number is called, sit at an empty consignment station. Provide the volunteer with your Consignor ID number. 3. Complete a Consignment Inventory Sheet (download here) as you consign each item so you can track your inventory. 4. You can consign a maximum of 10 items at a time, 20 items per month. 5. Only 5 like items are accepted each month; examples: 5 pieces of jewelry, 5 skirts, 5 pots, etc. 6. No item is consigned for less than $5.00. 7. Work with the volunteer to determine an appropriate price for your item. 8. “As is” items must be approved by a manager. 1. You can schedule an appointment at least one business day in advance of the date desired by calling Willing Hearts at 973-226-7488 or while you are in the shop. You must speak directly to a Willing Hearts volunteer to make the appointment. Recorded messages left to make an appointment are not acceptable and will not be answered. . 2. You can make a same day appointment only if there is a vacant appointment slot for that day. 3. On the day of the appointment, you should arrive at least 10 minutes in advance of the scheduled time. You do not need to take a number. 4. Upon your arrival, you should inform a volunteer at the consignment desk of your appointment time, and wait to be called to a consignment station. 5. If you arrive late, you will lose your appointment slot. You then become a regular walk-in consignor and must take a number to secure your place in the walk-in queue or on days when walk-ins are accepted. 6. Appointment Cancellations: You should call Willing Hearts in advance if you need to cancel your appointment. Phone message cancellations will be accepted. 7. The consignment process is the same as for a walk-in consignor. 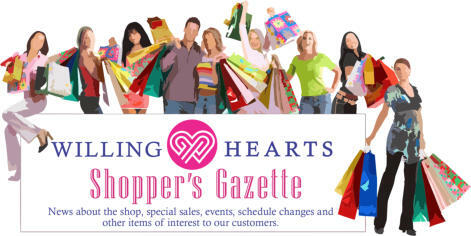 To download the Willing Hearts Weekly Consignment Schedule click here. A volunteer (at computer) assists a new consignor. 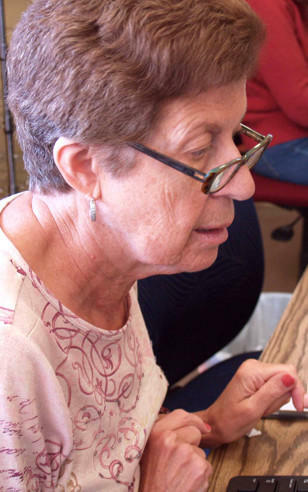 Another volunteer checks her consignment computer. CURRENT WILLING HEARTS CONSIGNMENT HOURS: Tuesdays 1 - 3:40 PM Appointments Only 4 - 6:40 PM Walk-Ins Only Wednesdays 10 AM – 12:40 PM Appointments Only Thursdays 10 AM – 12:40 PM Appointments and Walk-Ins Fridays 10 AM – 12:40 PM Appointments Only Saturday 10 AM – 12:40 PM Appointments and Walk-Ins You’ll find Willing Hearts business cards at the shop with this schedule on the reverse side. You can download and print a copy of the consignment hours here. RETRIEVING YOUR ITEMS Because we are a very busy shop with hundreds of active consignors, we cannot help you find your things. You will have to find them yourself. Once you have retrieved your items, take them to the jewelry counter where a volunteer will help you remove the tags and have you sign the back of each tag to prove that the items are yours. You cannot re-consign your items again for at least 6 weeks. You can check on the status of your account at any time during business hours. However, the sale of any item is not guaranteed until the close of the month because of the possibility of an unexpected customer return. Items that are donated to the shop after 4 weeks and sell at 50% or less help us cover our operating expenses. So we urge you to consider increasing your contribution in this way. PLEASE NOTE THAT WILLING HEARTS CONSIGNMENT SHOP IS NOT RESPONSIBLE FOR ITEMS LOST, STOLEN, OR DAMAGED. Managers Susan S (seated) and Susan M review data entry after a consignmwent session. CONSIGNOR ANNUAL MEMBERSHIP FEE REINSTITUTED Because of the increased demand for our services and an increase in our overhead expenses, Willing Hearts is reinstituting the annual membership renewal fee for all regular and unlimited consignor members. For Regular Consignors: Before you can consign as a regular consignor, you must pay the annual fee of $20. A new anniversary date will be established at the time of payment. For Unlimited Consignors (those enrolled prior to 12/31/16): Unlimited Consignors must pay the annual fee of $30. A new anniversary date will be established at the time of payment. Because of the increased demand for our services, we can no longer accept NEW unlimited consignors. For Hardship Consignors: Before you can consign as an Hardship consignor, you must pay the 3-month renewal fee of $30 for 2017. If you wish to continue consigning, you can renew this membership for an additional 3 months by paying another $30 renewal fee. You will be informed of any changes in fees and consignment rules well in advance of future renewals. Consignors in all categories will be informed of any changes in fees and consignment rules well in advance of future renewals. 1. If you choose to be a walk-in consignor, take a number at the cash register and wait to be called. Watch the electronic number display and wait to hear your number called. Missing your number means missing your turn in line. 2. When your number is called, sit at an empty consignment station. Provide the volunteer with your Consignor ID number. 3. Complete a Consignment Inventory Sheet as you consign each item so you can track your inventory. 4. You can consign a maximum of 10 items at a time, 20 items per month. 5. Only 5 like items are accepted each month; examples: 5 pieces of jewelry, 5 skirts, 5 pots, etc. 6. No item is consigned for less than $5.00. 7. 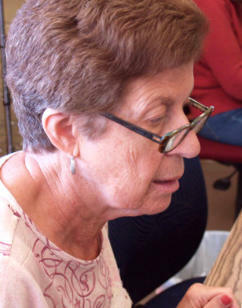 Work with the volunteer to determine an appropriate price for your item. 8. “As is” items must be approved by a manager. 1. You can schedule an appointment at least one business day in advance of the date desired by calling Willing Hearts at 973-226-7488 or while you are in the shop. You must speak directly to a Willing Hearts volunteer to make the appointment. Recorded messages left to make an appointment are not acceptable and will not be answered. . 2. You can make a same day appointment only if there is a vacant appointment slot for that day. 3. On the day of the appointment, you should arrive at least 10 minutes in advance of the scheduled time. You do not need to take a number. 4. Upon your arrival, you should inform a volunteer at the consignment desk of your appointment time, and wait to be called to a consignment station. 5. If you arrive late, you will lose your appointment slot. You then become a regular walk-in consignor and must take a number to secure your place in the walk- in queue or on days when walk-ins are accepted. 6. Appointment Cancellations: You should call Willing Hearts in advance if you need to cancel your appointment. Phone message cancellations will be accepted. 7. The consignment process is the same as for a walk-in consignor. To download the current Willing Hearts Weekly Consignment Schedule click here. CURRENT WILLING HEARTS CONSIGNMENT HOURS: Tuesdays 1 - 3:40 PM Appointments Only 4 - 6:40 PM Walk-In Only Wednesdays 10 AM – 12:40 PM Apts Only Thursdays 10 AM – 12:40 PM Apts, Walk-In Fridays 10 AM – 12:40PM Apts Only Saturday 10 AM – 12:40 PM Apts, Walk-In You’ll find Willing Hearts business cards at the shop with this schedule on the reverse side. You can download and print a copy of the consignment hours here. RETRIEVING YOUR ITEMS Because we are a very busy shop with hundreds of active consignors, we cannot help you find your things. You will have to find them yourself. Once you have retrieved your items, take them to the jewelry counter where a volunteer will help you remove the tags and have you sign the back of each tag to prove that the items are yours. You cannot re-consign your items again for at least 6 weeks. Items that are donated to the shop after 4 weeks and sell at 50% or less help us cover our operating expenses. So we urge you to consider increasing your contribution in this way. You can check on the status of your account at any time during business hours. However, the sale of any items is not guaranteed until the close of the month due to the possibility of unexpected customer returns. PLEASE NOTE THAT WILLING HEARTS CONSIGNMENT SHOP IS NOT RESPONSIBLE FOR ITEMS LOST, STOLEN, OR DAMAGED. Managers Susan S (seated) and Susan M review data entry after a consignment session. (Exceptions may sometimes be made at the manager’s discretion) Exceptions may sometimes be made at the manager’s discretion. • Animal accessories - new with tags • Appliances: new microwaves, toaster ovens, used toasters and irons in clean, like-new condition, small appliances new with tags/boxed or like-new condition • Books: non-fiction, coffee table, art, cooking, gardening, etc. • Craft items: new or like new, packaged appropriately • Dolls: accepted for winter holiday season only • Electronics: small CD and DVD players, small radios in working condition, current technology new telephones in original packaging • Exercise equipment: small weights, exercise belts, sport gloves, etc. • Footwear: new socks with tags, new stockings with tags and packaging • Frames - only sterling silver, crystal, Lenox, Waterford or other high-end • Gift wrap - only new and sealed • Glasses/mugs: ordinary sets of 2, 4 or more – with value of $6 or more one or more Waterford, Baccarat, Daum, Royal Doulton, etc. • Handbags: day wear $15. Willing Hearts value or greater evening wear $10 Willing Hearts value or greater vintage bags • Jeans: fall, winter, early spring only • Knives: new, specialty use in packaged complete sets new or like-new packaged complete sets • Luggage: new or like new condition, 2 or 4 wheels light weight, carryalls • Men's clothing, only new with tags for holidays and Father's Day • Mirrors (at manager’s discretion)* • Men's Accessories: wallets and jewelry at any time • Personal Grooming devices: new grooming items with tags, etc. • new toiletries and makeup • Pictures/paintings/photos: any size vintage or original artwork* • Pillows as matching part of NEW or like new bed sets • Plastic storage organizers - small • Quilts, comforters, blankets in season • Rugs: no larger than 8 feet by 10 feet • Shorts: spring and summer only • Tools: household and garden, new and used • Toys, games, puzzles: only NEW for the holidays • Vintage toys (with manager's approval) *FURNITURE AND PICTURES WIDER THAN 24” MUST BE SCHEDULED IN ADVANCE AT THE JEWELRY COUNTER. EXCEPTIONS MAY BE MADE FOR DONATED ITEMS ONLY BUNDLING OF LIKE ITEMS IS ACCEPTABLE VINTAGE IS ALWAYS AN EXCEPTION ITEMS MUST BE CLEAN AND WRINKLE FREE You can download and print a copy of this list here. • Animal Accessories and equipment that has been used • Apparel with advertising • Appliances: used microwaves, toaster ovens, etc. • Dried flowers • Chandeliers • Electronics: amplifiers, speakers TVs, VCRs. cassette players large CD and DVD players, large radios computers, computer equipment, peripherals FAX Machines, used telephones, answering machines • Exercise equipment, large • Food or medicine of any kind • Footwear including shoes and used socks, stockings • Frames that are small and inexpensive • Giftwrap that is opened or partially used • Gowns such as evening. Prom, bridesmaids, etc. • Jewelry: damaged • Luggage: worn, old, without wheels (unless a carryall) • Novels • Personal Grooming Devices that are used • Pictures, prints: generic, smaller than 12” wide • Pillows (except those included with new or like-new bedsets) • Plastic storage units: large • Rugs larger than 8’ x 10’ • Stuffed animals of any kind • Textbooks You can download AND PRINT a copy of this list here. Exceptions can sometimes be made at the manager’s discretion. • Animal accessories: new with tags • Appliances: new microwaves, toaster ovens, used toasters and irons in clean, like-new condition, small appliances new with tags/boxed or like-new condition • Books: non-fiction, coffee table, art, cooking, gardening, etc. • Craft items: new or like new, packaged appropriately • Dolls: accepted for winter holiday season only • Electronics: small CD and DVD players, small radios in working condition, current technology new telephones in original packaging • Exercise equipment: small weights, exercise belts, sport gloves, etc. • Footwear: new socks with tags, new stockings with tags and packaging • Frames - only sterling silver, crystal, Lenox, Waterford or other high-end • Gift wrap - only new and sealed • Glasses/mugs: ordinary sets of 2, 4 or more – with value of $6 or more; one or more Waterford, Baccarat, Daum, Royal Doulton, etc. • Handbags: day wear $15. Willing Hearts value or greater evening wear $10 Willing Hearts value or greater vintage bags • Jeans: fall, winter, early spring only • Knives: new, specialty use in packaged complete sets new or like- new packaged complete sets • Luggage: new or like new condition, 2 or 4 wheels light weight, carryalls • Men's clothing, only new with tags for holidays and Father's Day • Mirrors (at manager’s discretion) • Men's Accessories: wallets and jewelry at any time • Personal Grooming devices: new grooming items with tags, etc. new toiletries and makeup • Pictures/paintings/photos: any size vintage or original artwork • Pillows as matching part of NEW or like new bed sets • Plastic storage organizers - small • Quilts, comforters, blankets in season • Rugs: no larger than 8 feet by 10 feet • Shorts: spring and summer only • Tools: household and garden, new and used • Toys, games, puzzles: only NEW for the holidays • Vintage toys (with manager's approval) EXCEPTIONS MAY BE MADE FOR DONATED ITEMS ONLY BUNDLING OF LIKE ITEMS IS ACCEPTABLE VINTAGE IS ALWAYS AN EXCEPTION ITEMS MUST BE CLEAN AND WRINKLE FREE Furniture and pictures wider that 34” must be scheduled in advance at the jewelry counter. You can download and print a copy of this list here. • Animal Accessories and equipment that has been used • Apparel with advertising • Appliances: used microwaves, toaster ovens, etc. • Chandeliers • Dried flowers • Electronics: amplifiers, speakers, TVs, VCRs. cassette players, • large CD and DVD players, large radios, computers, computer equipment, peripherals, FAX Machines, used telephones, answering machines • Exercise equipment, large • Food or medicine of any kind • Footwear including shoes and used socks, stockings • Frames that are small and inexpensive • Giftwrap that is opened or partially used • Gowns such as evening. Prom, bridesmaids, etc. • Jewelry: damaged • Luggage: worn, old, without wheels (unless a carryall) • Novels • Personal Grooming Devices that are used • Pictures, prints: generic, smaller than 12” wide • Pillows (except those included with new or like-new bedsets) • Plastic storage units: large • Rugs larger than 8’ x 10’ • Stuffed animals of any kind • Textbooks • You can download AND PRINT a copy of this list here. 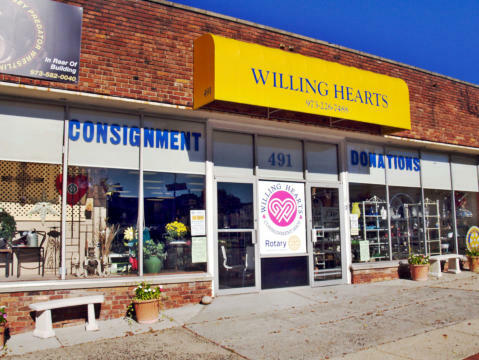 Willing Hearts Consignment Shop is managed and fully staffed by volunteers for the benefit of the Rotary Club of the Caldwells and its various projects and charities. We’re always on the lookout for dynamic and friendly people to help provide great customer service and an outstanding thrifting experience in our shop. Volunteers will accept merchandise consignment and donations, assist customers at our fitting rooms, refill and organize our clothing racks and housewares shelves and work with staff on a wide variety of special projects. Each volunteer is trained to have knowledge of each area of the shop, and each person’s volunteer experience can be tailored to their personal skills and interests. Click here for a Willing Hearts Consignment Shop Volunteer Job Description that you can download. If you ask a Willing Hearts Volunteer why they give their time they’ll probably say: Someone asked us. We almost automatically respond when someone tells us that we are needed. We are motivated by our view of the world – to try to improve the quality of life in The Caldwells. We are looking for the external recognition and internal good feeling that comes with volunteering. We have untapped skills that can used by volunteering with Willing Hearts. We actively enjoy the kind of work that volunteering entails: it’s fun for us. We enjoy the social situation, and value the contacts with other volunteers, consignees, staff members and shoppers. This is often true for people who don’t work outside the home, and don’t have the daily social contact that such work brings with it – seniors, stay-at-home moms, etc. It makes us all feel needed and useful. Click here for a copy of the Volunteer Appointment Procedure. 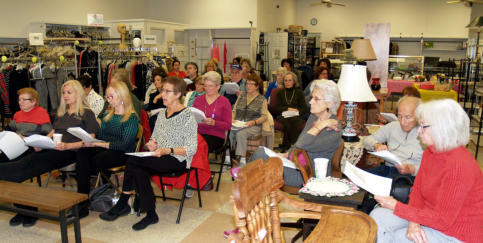 Willing Hearts Volunteers meet in January of 2017 in the newly refurbished shop to plan the next consignment season. Volunteering at Willing Hearts can be a great way to develop skills, learn more about career options, make friends, or even just shake up your routine. Yet Willing Hearts volunteers rarely speak of the benefits of volunteering to themselves — maybe it feels a bit too self-centered, or too far from the altruistic vision of the selfless volunteer. But who says that doing good and enjoying yourself can't happen at the same time? And don't forget that sometimes it just feels good to be valued; as a volunteer you can contribute unique skills, experiences, and perspectives. Volunteering can be a fun, meaningful way to make new friends. New to the community? Looking to branch out socially? Simply looking for something to do with new people? Volunteer and get to know others who care about the same issues that you do. Last but not least, volunteering is one of the best ways we know of to make a difference in your community. Whatever your passion, however you get involved, volunteering offers a way to have a real and lasting impact on the world. So why not go for it? Click here to download a Willing Hearts Volunteer Application Form or stop by the shop! And click here to download a PDF version of the Willing Hearts Consignment Shop Volunteer Flyer.
. . . AT WILLING HEARTS! THINKING OF VOLUNTEERING? IT’S OK TO ASK: WHAT’S IN IT FOR ME? Willing Hearts Consignment Shop, sponsored by The Rotary Club of the Caldwells, has been recently re-organized to better serve the community. Under the leadership of new co-managers, Susan S (operations) and Susan Mc (volunteers), with the support of Rotarians, the shop is enjoying renewed success. 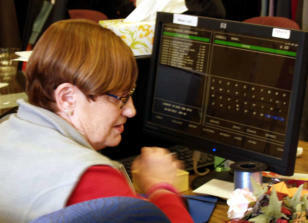 Staffed solely by volunteers, the shop is providing better service with new and streamlined systems. New inventory by consignment and donation arrives daily. Consignment is scheduled five days per week and is available by appointment and walk-in. All the proceeds are dispersed by the Rotary Club for a variety of charitable projects. You can schedule an appointment at least one business day in advance of the date desired by calling Willing Hearts at 973- 226-7488 or while you are in the shop. This cuts down dramatically on waiting time. Check here for details. Because of the increased demand for our services and an increase in our overhead expenses, Willing Hearts is reinstituting the annual membership renewal fee for all members. Before you can consign as a regular consignor, you must pay the annual fee of $20 for 2017. A new anniversary date will be established at the time of payment. This additional funds allows us to serve our customers with maximum productivity and in a more efficient and attractive environment. Details are here. All consignments, inventory and transactions have been computerized. This is of great advantage to both shoppers and consigners. Digital accounting procedures insure that consignor items are priced more accurately and that shoppers are assured of exactness. Interiors were completely repainted and new fixtures added. The jewelry department and boutique were greatly enlarged and carpeted with new display cases added. The display window was remodeled with paint, carpeting, display grids and steps for easier access. This new logo, designed and donated by George Bales, graphic artist, com- bines a “W” and heart shape. Willing Hearts Consignment Shop, sponsored by The Rotary Club of the Caldwells, has been recently re-organized to better serve the community. Under the leadership of new co-managers, Susan S (operations) and Susan Mc (volunteers), with the support of Rotarians, the shop is enjoying renewed success. 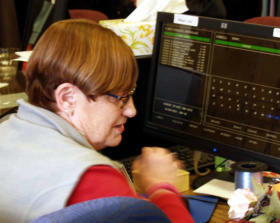 Staffed solely by volunteers, the shop is providing better service with new and streamlined systems. New inventory by consignment and donation arrives daily. Consignment is scheduled five days per week and is available by appointment and walk- in. All the proceeds are dispersed by the Rotary Club for a variety of charitable projects. You can schedule an appointment at least one business day in advance of the date desired by calling Willing Hearts at 973-226-7488 or while you are in the shop. This cuts down dramatically on waiting time. Check here for details. All consignments, inventory and transactions have been computerized. This is of great advantage to both shoppers and consignors. Digital accounting pro- cedures insure that consignor items are priced more accurately and that shoppers are assured of exactness. and other items of interest to our customers. The new logo, designed and donated by George Bales, graphic artist, combines the letter “W” and a heart shape. The newly revised Rotary logo is included. The design is part of a new branding program at the shop in which all promotional materials carry the logo. Jerry S. serenades the crowd with his violin. < Barbara M. clarifies a point. The annual Willing Hearts Volunteers Christmas Party was held December 11, 2016 in Fairfield at Tavern 292. Pictured (from left to right, first row) are Sondra L., Susanne B., Susan M., Susan S. In the second row: Maria D., Tommy H., Susan L, Joyce F., Fred S., Barbara M., Lana G, Lillian B., In the third row: Phil D., Grace D., Tatiana R., Pattie M., Carol C., John B., Lois R., Angela W., Pat M., Gloria S., Carol B. A sumptuous holiday banquet was served followed by the presentation of Willing Hearts Gift Certificates to each volunteer. Sondra L of Roseland and Barbara M of Caldwell were presented with the award by Sam K in person at the first Willing Hearts Staff Meeting on Monday, January 2, 2017 at the shop. They have both volunteered at Willing Hearts for twenty years. Since 2017 marks the Twentieth Anniversary of Willing Hearts, Sondra and Barbara are pioneers! < Special retirement certificates were presented to Susan Sorell and Carol Kent for their long and much appreciated volunteer service. LILLIAN BIN IS 87 YEARS YOUNG! The Rotary Club of the Caldwells recently donated $2,000 to the COPE Center in Montclair, which provides counseling and behavioral health services to individuals and families in Essex County. The photo was taken in front of Willing Hearts Consignment Shop which is a primary source of Rotary funding. Photo: (left to right) Erin Gloor, Rotary member, Tim Blattner, Rotary member, Kevin Hersh, Rotary member, Pat Marchese of Willing Hearts, Miriam Irvwin Member of the Board of Trustees of COPE, President of the Caldwell Rotary Club Steven Colacurcio, Anthony DeLuca Secretary of the Rotary Club, Peery Ceccnhini, Rotary member. Originally published June 11, 2017 in the Caldwells Patch which supplied the photo. So she and a few of her Willing Hearts Volunteer pals celebrated the occasion at The Italian Village on the twenty fifth of May, 2017. Fred S. holds the smart phone as he, Lois R. and Sue B. pose for a great shot on June 11, 2017! Willing Hearts Volunteers donated $500. directly to The Boy Scouts of America, Troop 9. The volunteers of Willing Hearts Consignment Shop donated $500 to the Boy Scouts of America Troop 9 outside of Jack’s Super Foodtown Supermarket on Sunday., November 20, in Caldwell. The donation was for Troop 9’s “Eagle Project: Collection for Troops,” which is part of Opera-tion Jersey Cares-Sup-port Our Troops. All monetary and other donations being collected will be used to support the men and women who are now serving in U.S. Armed Forces overseas. While Willing Hearts is a projects of Rotary Club of the Caldwells, some donations are made directly by the volunteers such as the Eagle Project and others. Pictured at right are Susan S and Susan M presenting a check to Chris Vega, Life and potential Eagle Scout. Operations Manager Dr. Sue presented award at Rotary Installation Dinner, June 20, 2018 at Essex Fells Country Club. With gratitude to Susan and her Willing Hearts “Warriors,” J. Tim Blattner, Rotary Club Board Member representing Willing Hearts and Susan Lubalin, Rotary President Elect praised Dr. Sue for her leadership and organizational skills. Dr. Sue, upon receiving the S M “Sam” Kent “Service Above Self” award said in her brief remarks that she is merely a representative of a remarkable group of volunteers who keep the shop humming. She also mentioned her husband, George Bales, and his contributions of art and design including redesigned logo, posters, signs and web site, www.willinghearts.com. Dr. Sue Skalsky, Operations Manager at Willing Hearts Consignment shop presents the shop’s latest contribution. At its March 26, 2019 luncheon, The Rotary Club of the Caldwells was presented with another check for $20,000, the latest contribution from the shop. The money is used to support local projects and charieties in the West Essex area. Left to right: Rotatrian Tim Blattner, Rotary President Samantha Cordaro McCoy, Dr. Sue and Rotarian Pamela Licht. Sondra L of Roseland and Barbara M of Caldwell were pre- sented with the award by Sam K in person at the first Willing Hearts Staff Meeting of the year on Monday, January 2, 2017 at the shop. They have both volun- teered at Willing Hearts for twenty years. The annual Willing Hearts Volunteers Christmas Party was held December 11, 2016, in Fairfield at Tavern 292. Special retirement certificates were presented to Susan Sorell and Carol Kent for their long and much appreciated volunteer service at Willing Hearts. The volunteers of Willing Hearts Consignment Shop donated $500 to the Boy Scouts of America Troop 9 outside of Jack’s Super Foodtown Supermarket on Sunday., November 20, 2016. The donation was for Troop 9’s “Eagle Project: Collection for Troops,” which is part of Opera-tion Jersey Cares- Sup-port Our Troops. All monetary and other donations being collected will be used to support the men and women who are now serving in U.S. Armed Forces overseas. While Willing Hearts is a project of Rotary Club of the Caldwells, some donations are made directly by the volunteers such as the Eagle Project and others. Pictured at right are Susan S and Susan M presenting a check to Chris Vega, Life and potential Eagle Scout. The Rotary Club of the Caldwells recently donated $2,000 to the COPE Center in Montclair, which provides counseling and behavioral health services to individuals and families in Essex County. The photo was taken in front of Willing Hearts Consignment Shop which is a primary source of Rotary funding. Photo: (left to right) Erin Gloor, Rotary member, Tim Blattner, Rotary member, Kevin Hersh, Rotary member, Pat Marchese of Willing Hearts, Miriam Irvwin, Member of the Board of Trustees of COPE, President of the Caldwell Rotary Club Steven Colacurcio, Anthony DeLuca Secretary of the Rotary Club, Peery Ceccnhini, Rotary member. Originally published June 11, 2017 in the Caldwells Patch which supplied the photo. So she and a few of her Willing Hearts Volunteer pals celebrated the occasion at The Italian Village in Caldwell on the twenty fifth of May, 2017. Volunteer Jennifer Masson dressed as an old fashioned usherette for Halloween, October, 30, 2018. WILLING HEARTS COMES THROUGH AGAIN FOR THE ROTARY CLUB OF THE CALDWELLS! Dr. Sue Skalsky, Operations Manager at the Willing Hearts Consignment Shop presented the Rotary Club of the Caldwells a check for $20,000 at their March 26, 2019 luncheon. The money is used to support The Rotary’s local [projects and charities in the West Caldwell area. A COLLECTION OF DOCUMENTS AND ASSORTED PHOTOS TO DOWNLOAD OR VIEW. There are two photo galleries here. The first includes candid shots of a few friends at Willing Hearts, mostly volunteers and customers - all folks we are fond of. The second consists of photos of just a few of the thousands of items that have been consigned and sold over the past year. We hope it gives new consignors a few ideas of what’s popular. We’ll update often. PLEASE NOTE THAT THE ABOVE DOCUMENTS HAVE BEEN UPDATES RECENTLY! These documents are formatted as PDF files. To read these files you must have Adobe Acrobat Reader installed in your device. You can download Adobe Acrobat Reader DC HERE free. This is the newest version. Acrobat Reader DC runs on Windows 7 and up. Documents can be viewed on and printed from Internet Explorer 8,9,10 and 11 plus Google Chrome, Mozilla Firefox and Opera browsers. The MAC version runs on OS X, versions 10.9, 10.10 and 10.11. Here is the ANDROID version and the MAC version for mobile phones. A COLLECTION OF DOCUMENTS TO DOWNLOAD, VIEW OR PRINT - ALL DOCUMENTS HAVE BEEN RECENTLY UPDATED. WE ACCEPT CASH AND CREDIT CARDS (EXCLUDING AMEX). SORRY, WE CANNOT ACCEPT CHECKS. TERMS: • ALL SALES ARE FINAL. • NO REFUNDS OR EXCHANGES. • RETURNS ON FAULTY FULL PRICE ELECTRICAL ITEMS WITHIN 2 BUSINESS DAYS OF PURCHASE FOR STORE CREDIT ONLY. * • NO RETURNS WITHOUT RECEIPT. • NO RETURNS OF ANY KIND ON SALE MERCHANDISE. *Faulty full price electrical items within 2 days.